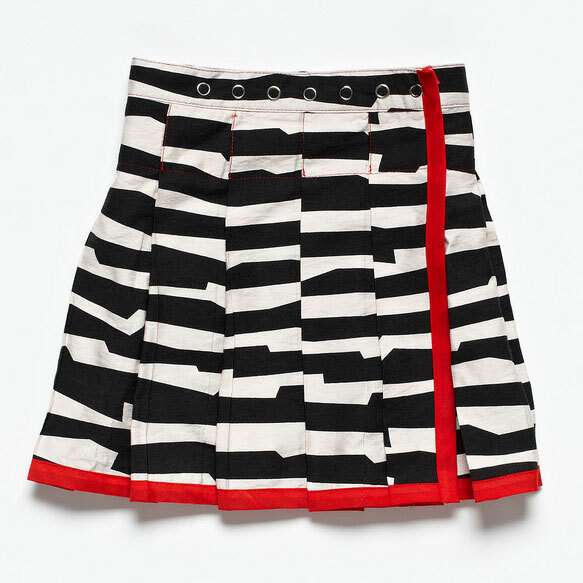 From Knuffle Kid's "Passport Agogo" collection, the design of this skirt is ingenious! A crossover style, the skirt has a row of press studs allowing it to fit many different sizes. The soft pleats are secured at the top by red feature stitching (to keep them sitting neat & flat). In a classic black and white colourway with red trim, this skirt will so practical - and stylish! The stripes themselves have a distinctive twist too - rather than flat horizontal stripes, they are abstracted into irregular angles... Full of energy, just like your little one! Beautifully made, this skirt will be loved for years to come. Made in Melbourne. 100% Cotton. May contain quirkiness.